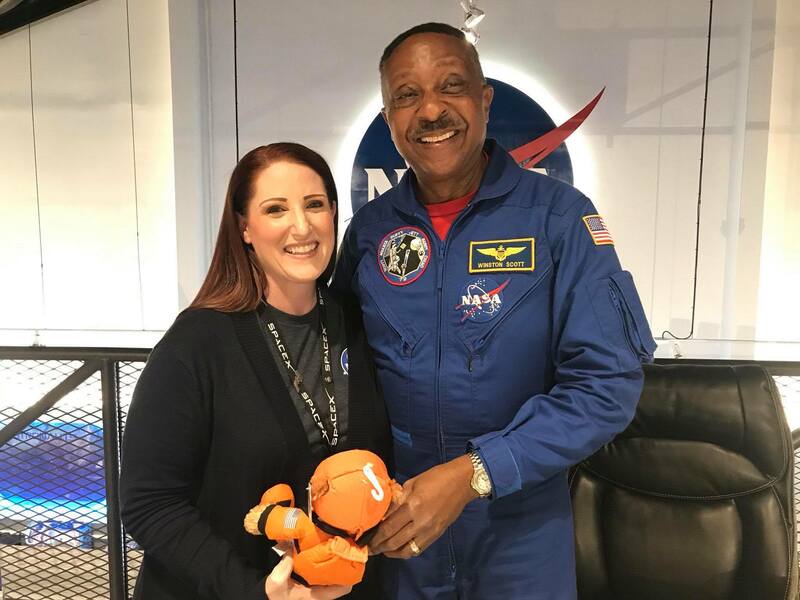 Courtney DeLeon with astronaut Winston Scott. Recently, Klein ISD’s 2018 Teacher of the Year, Courtney DeLeon, had an out of this world experience. DeLeon was chosen by NASA to attend the SpaceX Commercial Crew uncrewed flight test at Kennedy Space Station with the NASA Social Program. During her four-day Florida trip, DeLeon toured multiple NASA facilities, witnessed the Crew Dragon spacecraft blast off into outer space, and explored numerous pathways in the space agency that she now enjoys sharing with the awe-inspired learners in her classroom. It will take many minds to colonize Mars, which is why NASA employs such a wide range of skills. She said that their environment of cultivating talent from every field felt familiar to the Promise2Purpose model that she knows and loves. Although NASA likely hasn’t read our guiding documents, DeLeon enjoyed making that connection and engaging in that valuable conversation with her students when she returned from taste-testing space lettuce. Her classroom has been full of student-focused, nonstop space talk. DeLeon has been in touch with NASA since her trip about a possible soilless plant prototype. She is officially part of their think tank and could not be more excited. Courtney embodied the essence of a forever learner by seeking out this opportunity to grow and sharing it with us! We are proud that she is also a part of our Klein ISD think tank.